Like many Americans, technically I’m what you might call a “mutt”- like a big pot of stew with lots of bits and bobs, my family tree is peppered with Scottish, English, Native American, French, German and probably a bunch of other genes I’m unaware of. But, coincidentally, I have Alsatian roots on both my mother’s and father’s side. 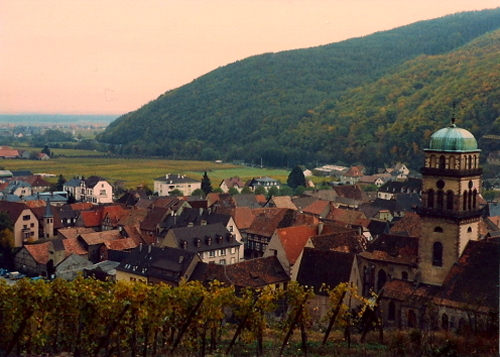 My mom’s grandfather’s family, the Steffeses, and my dad’s father’s side, the Lothamers (originally Lotthammer) are both from Alsace and the Black Forest region (on the other side of the Rhine river, which divides Alsace from Germany). 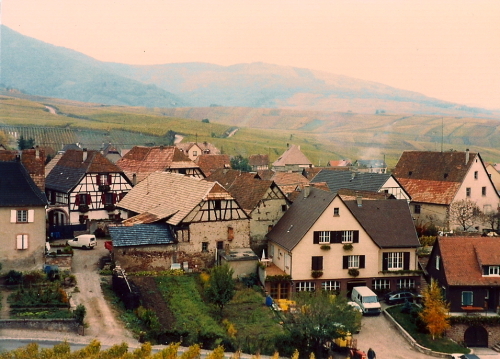 So, given the fact that I have been enamored with French language and culture from an early age, and that I have a French first name and German last name, I have adopted Alsace as my pays and taken to telling people with a wink that I’m alsacienne. One of my uncles has done pretty extensive genealogical research on the Lotthammer family and has made contact with several families living in Alsace and Germany today that are related to us. 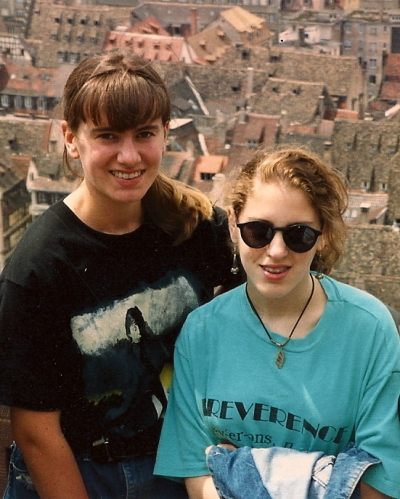 When I was 16, he arranged a trip for me and my best friend to travel to Alsace and stay with some of the families he had made contact with through his research (yes, that’s me in the photo above on the right at age 16… the French got a kick out of my braces!). 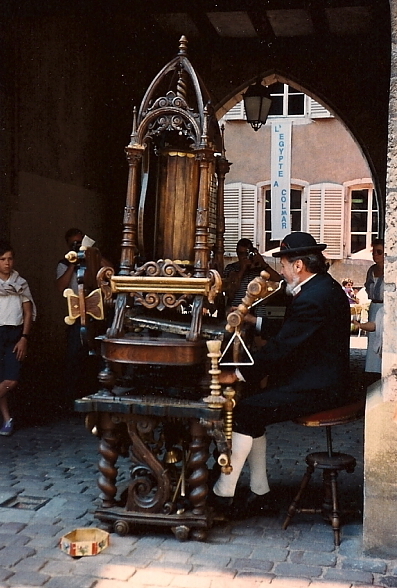 We were there for three weeks, and visited the region extensively- from the largest city, Strasbourg, to a tiny village called Guewenheim, and several towns in between (Colmar, Mulhouse, Thann, Belfort…). The experience was nothing short of transformative for a suburban teenager who until then had barely traveled in the U.S. let alone Europe. That trip was a huge stepping stone on my path to adventurous eating and cooking. 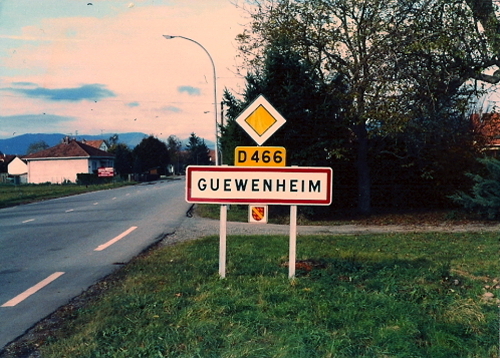 In Guewenheim, we stayed with a family whose refrigerator was unplugged and used as a pantry, because they ate fresh food every day and had no need to refrigerate anything! (Any leftover scraps were given to their lucky chien, Zora.) One of the funniest memories from that trip was going over to the home of an elderly woman in the village for a lesson in making kugelhopf, only to discover that the woman’s Alsatian dialect was totally incomprehensible to our limited third-year French ears. Let’s just say there was a lot of nodding and smiling going on that afternoon, and that I still don’t know how to make kugelhopf! It took a while for my budding food curiosity to convert itself into a love for cooking, but some of the first recipes I ever made from a cookbook came from France: The Beautiful Cookbook. This was a gift from another uncle to our family, and since my parents weren’t the type to cook from a “fancy” French cookbook, the book defaulted into my possession. 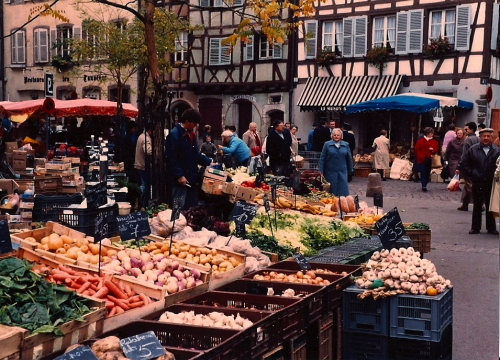 I still have a great nostalgia for the hours I spent as a teenager poring over the photos, reading about the different regions of France, and staring longingly at all the strange food depicted between its covers, trying to conjure what it would taste like. 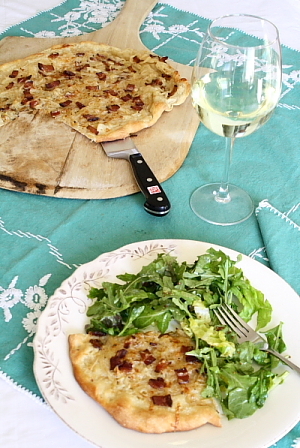 Luckily, not all the recipes were out of reach, and I taught myself to make tarte flambée (basically a “pizza” with crème fraîche, bacon and onions) so I could have a little taste of Alsace here in the States. With crème fraîche being readily available now, along with ready made pizza dough, this is now something that’s totally doable for a weeknight supper, and I’ve found myself making it fairly often of late. One of these days I’ll make a choucroute garnie, the most famous of Alsace’s regional dishes, but with spring around the corner, I don’t know how many more large heavy dinners will be in the works, so it may have to wait until next winter at this point. If I get really motivated maybe I’ll even make my own sauerkraut! P.S. This is a GREAT recipe to adapt to the grill- see this post for instructions on grilling pizza. Photo note: all of the non-food photos are scans of old photos from my trip. The top two are in Colmar; the third was taken atop Strasbourg’s cathedral, and the remainder I believe are from Guewenheim (possibly another nearby village). Notes: This will make two approximately 10″ tarts, depending on how thin you stretch your dough. Each tart serves two as a main course or more as an appetizer, so you can make the second tart right away or save the leftover dough and toppings for a quick and easy after-work meal. Cheese is not traditional per se, but I had some and wanted to use it up. If you do use cheese, do so sparingly, otherwise you’ll end up with a pretty greasy tart. The nutmeg may be non-traditional as well but I love nutmeg with cream, bacon and onions so I always include it. White pepper vs. black is more a visual thing, if you don’t want black specks on your white food, use the white pepper. Place a pizza stone in the oven on the center rack and preheat to 475. OR, make this on the grill. 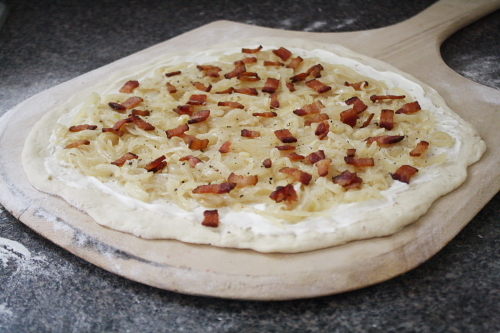 Remove your dough from the refrigerator and allow to come to room temp while you prep the onions and bacon. Heat a medium (10″ or 12″) cast iron or aluminum skillet over medium heat. Cut the bacon into 1/4-” strips (I like to use a kitchen scissors and just snip the bacon right over the pan) and fry to your preferred doneness. While the bacon is frying, cut your onions. I like to do thin rings but you can dice it if you prefer. Remove the bacon with a slotted spoon and drain on paper towels. Pour off some of the bacon fat, leaving enough in the pan to fry the onions. Saute the onions over medium-high heat until soft and golden. Put a generous amount of flour on a pizza peel or other flat surface such as a cookie sheet with no lip (in a pinch, I have used an upside-down cookie sheet; you just need to be able to slide it off onto the pizza stone). 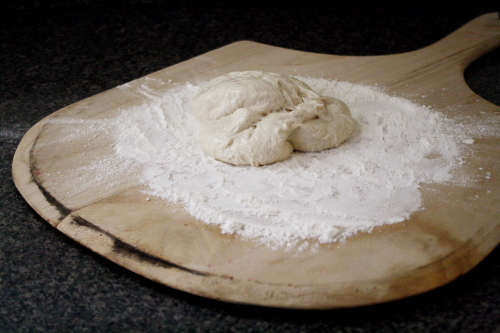 Take one of your dough balls and flour it until it is dry to the touch. 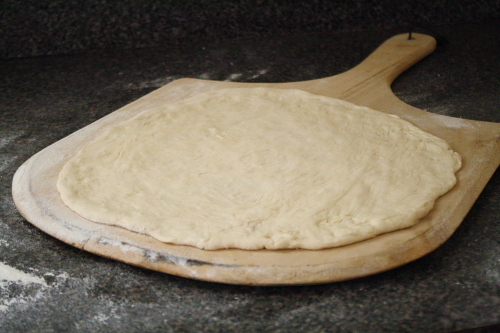 Gently stretch the dough, using your fists, flouring as you go to keep it from sticking to your hands or the pizza peel. I like to get mine as thin as possible, but if you prefer a chewier crust you can adjust accordingly. Don’t forget that your dough will shrink back a bit, so make it slightly thinner than you think you’ll want it. When you’re done, place the dough on the peel and shake it, making sure the dough moves freely and is not sticking anywhere. 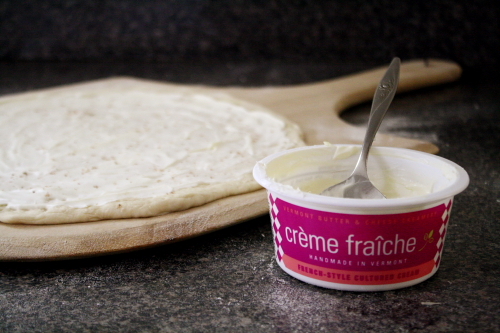 Working as quickly as possible, spread a thin layer of crème fraîche over the dough, about 1/4 cup or a little more if needed. Top the tart with half the onions, half the bacon, a few grinds of pepper and nutmeg, and cheese if using. Slide the tart onto the pizza peel and cook until the crust is golden, 5-10 minutes depending on how thick you stretched the dough. Brush the flour off the peel and use it to serve the tart. This entry was posted in Appetizers & Finger Food, Bacon, Baking, French Food, Grilling, Recipes, Travel and tagged Alsace, Bacon, cheese, crème fraîche, family, Grilling, onions, pizza, recipe, tarte flambée, Travel. Bookmark the permalink. What a great read. I would have loved to have an experience like that. I guess I will have to settle for making the recipe! Just a few points of clarification – the cookbook was a gift from Uncle Joe. My grandmother’s maiden name was Eby and she married a Steffes. Both may have had family roots in Alsace. My dad’s mother’s maiden name was Bricker, also German. OK, looks like I should have done my homework a little more! I did know the cookbook was from Uncle Joe though. What a beautiful village! That recipe sounds delicious I can’t wait to try it out, thanks for posting! 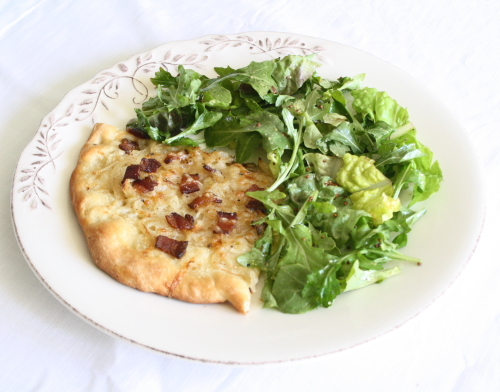 I have some leftover Easter ham that will be perfect for a tarte flambee. thanks for the inspiration!